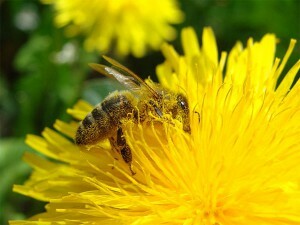 Figure 7.43: A bee demonstrates active pollination. “Pollination” refers to the transfer of pollen, which is the male gamete (reproductive cells) in plants, to the structures containing the female gametes, ovaries, on the same or other plants for the purpose of reproduction. Flowers are the structures that produce both male and female gametes. Flowers range widely in their morphology based on how they are pollinated; flowers may be small or large, colorless or colorful, odorless or smelly. Pollination is achieved in many ways among different plant species, but in general plants are either pollinated passively, by the wind, or actively, by animals. A wind pollination syndrome is fairly straightforward to characterize, but there is enormous diversity in pollination syndromes involving animals. The majority of plants are insect pollinated – insects actively carry a flower’s pollen to another flower. When pollen reaches a stigma, a pollen tube grows down the style to the ovary, where the pollen’s genetic material is deposited, and fertilization occurs. The ovary then develops into one or more seeds and their accompanying fruit. Fruit morphology is generally determined by its method of dispersal.